Castle Wars is a safe combat-based team game which lasts ten minutes. The goal is to breach the other team's defences and capture the flag atop their castle, while also defending your own castle and flag. Participants may choose to ally themselves with Saradomin or Zamorak, while followers of Guthix may be placed with either team in order to ensure that the teams are of equal size. Your team will score one point for each time it manages to capture the enemy flag, and the team with the most points at the end of the match wins. 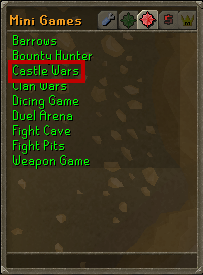 There are only a few requirements to join a Castle Wars match, which are of not bringing food, capes, helms nor coins to the arena. 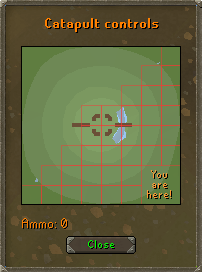 Apart from that, there are no requirements to join in, however having strong combat skills is highly recommended as Castle Wars is a combat-based minigame. All three sides of the combat triangle are commonly used, with rangers and magers tending to guard and defend the base while the meleers attack the enemy base. To join a match, choose which team you would like to ally and enter the corresponding portal. 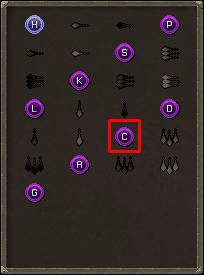 Entering the red portal will enroll you on the Zamorak team, and entering the blue portal will enroll you on the Saradomin team. 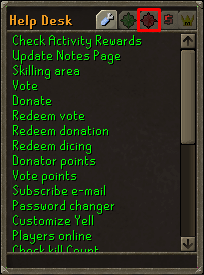 The green portal is the Guthix portal; if you choose to go through this portal you will be enrolled on whichever team currently has the fewest players, be that Saradomin or Zamorak. After you have entered the portal of your choosing you will be put into the waiting room. The waiting room is where the players wait for the next game to start. 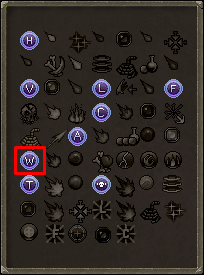 Once there, Saradomin team members will find themselves wearing a blue cape, while Zamorak team members will be wearing red capes; these are automatically removed when leaving the game. The time remaining until the next game begins is displayed near the top of the screen in white text. You will need at least one player per team for the match to begin. Each match lasts for twenty minutes, with a five minute interval between each one. If you need to leave, you can do so through the portal of the god's colour located inside the waiting room. If another player leaves an ongoing game, a window will appear asking if you wish to enter the game. The first player to answer yes will join the ongoing game. 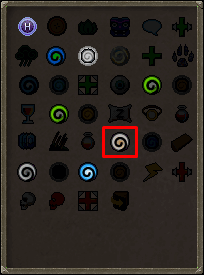 Players wearing items associated with another god will be turned into either a sheep (if entering Guthix), hare (if entering Saradomin) or imp (if entering Zamorak) for the duration of their stay in the waiting room. The castle wars arena is split from north-east to south-west by a river. North-west of the river is the castle of Zamorak and south-east of the river is the castle of Saradomin. 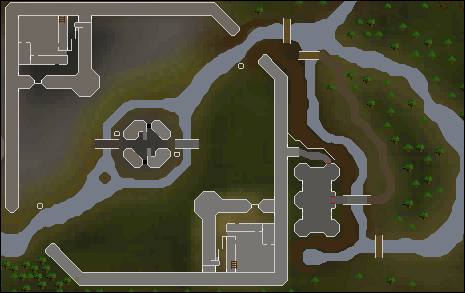 In the centre of the arena is an island with four towers, two trapdoors that lead to the dungeon and a bridge connecting it to each area, thus connecting the lands of Zamorak and Saradomin. At each end of the river are stones which can be jumped across to reach the opposing team's land. In the dungeon, each castle has two tunnels leading from it to a central cavern, located under the island. There are ladders in the north-west and south-east corners of the dungeon leading to their respective castles. During a match, there will be an overlay on the game window that gives you information about the current match in progress. The overlay shows information at the top, at the top-left and on the left side of the screen. The interface at the top-left of the screen details whether or not the flags are in their areas (safe), have been dropped, or have been taken by the opposite team. The side interface details how much time is left in the game, the defences of your castle's main gate and side gate, whether the team's two tunnels have been collapsed or cleared, and whether the team's catapult has been damaged or is operationaln. You should use this to determine if you should defend your castle or not. Each castle has multiple floors connected by stairs and ladders. The armoury is on the ground floor, the respawn room is on the first floor, a trapdoor room (with access to the respawn room) is on the second floor and the flag room is on the top floor. 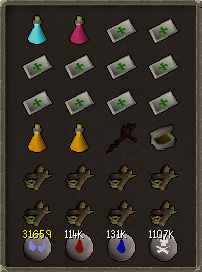 The armoury room is where all the castle wars items (except bandages) are found. This area should be left open at all times so that team members can freely restock their supplies. The respawn room is where the game begins. In this room, there is a table of bandages and an altar where players can recharge their prayer points. The trapdoor room is usually attended by rangers and magers whose goal is to guard and defend the team's flag. The flag room is where the team's flag is located, in its flag stand. If the enemy steals this and manages to carry it to this same part of their own castle, they will score a point. The enemy castle is identical to yours. There is a small island with two bridges connecting it in the middle of the map. It has two towers on it with stairs leading to the top which players can use to snipe enemy players from above, two buildings adjacent to the towers which can be entered and used for cover and two ladders leading down to the middle of the underground caves. Controlling the middle island gives the team an advantage over the other, since it will be easier to rush the enemy castle. 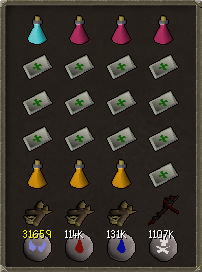 Exploding them with two explosive potions. If one of these tunnels has been cleared of rocks, you'll then be able to mine the wall nearby to collapse the area again (you can also do that with a explosive potion). Throughout the game, players can acquire a range of tools that can aid them in successfully capturing the other team's flag and defending their own. Since a lot of players rush the enemy castle by freezing the opponents, you should bring the best mage-defensive gear you can afford, in order to avoid ice barrage and freeze them as well. If you are planning to rush, it's worth bringing an Elysian spirit shield or Primal kiteshield (b), to reduce the amount of bandages that you will need. 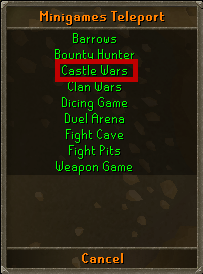 By winning, drawing or losing the game, you will be rewarded with Castle Wars tickets. You earn three tickets if you win, two if you draw or one if you lose. 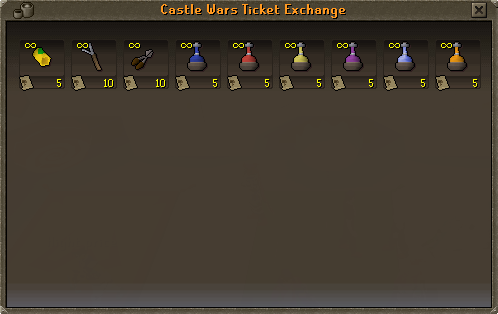 Players with best castle wars performance (most kills, most captures and most catapult damage) receive extra tickets (+2). 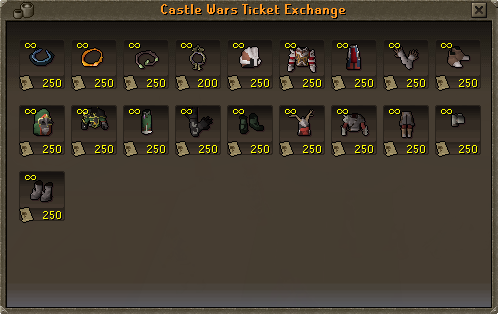 Every player receives extra tickets (+1) when Max is promoting Castle Wars.